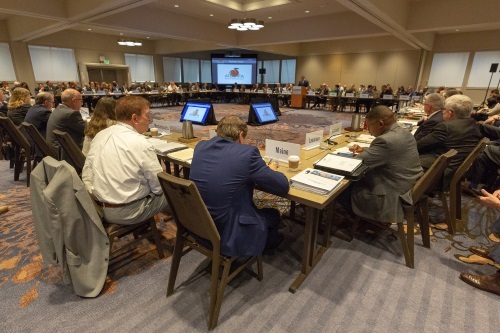 The American Association of State Highway and Transportation Officials approved four policy statements at its annual meeting in Atlanta on Sept. 24 that it plans to share with the American Road & Transportation Builders Association and the Associated General Contractors of America via the AASHTO-AGC-ARTBA Joint Association Committee, which develops official recommendations that are then sent to each organizations for potential adoption and implementation by their memberships. AASHTO’s main policy statement amended and adopted at its annual meeting – dubbed “Fixing the Federal Highway Trust Fund Cash Shortfall” – commits its Transportation Policy Forum to “recommend a specific revenue solution” based on the need to assure solvency of the Highway Trust Fund by the group’s 2019 spring meeting. That’s because AASHTO estimates that states will see about a 50 percent reduction in highway funding from fiscal year 2020 through 2021 – a reduction from $47 billion to $23 billion – with federal transit obligations expected to “zero out” in fiscal years 2021 and 2022 due to a steeper shortfall in the Mass Transit Account. “Congress must act promptly to ensure the solvency of the Highway Trust Fund in order to prevent significant planning and construction disruptions to highway and transit projects, to provide stable cash reimbursements to states for costs already incurred, and to ensure and enhance many national benefits of the federal surface transportation program including jobs, economic competitiveness, safety, personal mobility and quality of life,” AASHTO said in its statement. A second policy statement adopted by AASHTO at its annual meeting seeks to clarify and optimize “Buy America” regulations in order to minimize the possibility of project costs and delays that could result. “In some states, interpretations of the Buy America rule had required costly certifications and documentation for inexpensive items such as nuts, bolts, washers and tie wires,” the group said. While AASHTO stressed that it is “not seeking to undermine core Buy America principles, including the coverage of ‘permanently incorporated’ materials which Federal Highway Administration has regularly enumerated,” on the project level, the association wants those rules to be interpreted with a “common sense” approach, ensuring that the burden of compliance on state DOTs and contractors alike does not lead to the likelihood of cost increases and delays on the project. A third policy statement dealt with relocating underground utilities located in in highway right-of-ways, which continues to be one of the leading causes of delay in getting projects completed once the construction phase has started, AASHTO said. The policy statement noted that a new organization, “Gold Shovel Standard,” formed by pipeline companies, is attempting to significantly shift the risk for underground utility protection from a shared responsibility to one of absolute liability borne primarily by the excavator. Thus its third policy statement calls for public agencies reject the Gold Shovel Standard organization’s efforts to promote this “one-sided” approach to responsibility for utility protection because it undermines the collaborative efforts of shared responsibility. The group’s final policy statement is entitled “Pushing Technology Use to Lowest Level Feasible” and seeks to identifying methods that can defray relatively high upfront technology acquisition costs for smaller firms, especially given the long-term productivity benefits that can result, along with identifying and addressing any federal and state regulatory barriers that inhibit deployment of “everyday tech,” and conversely, identifying federal and state actions that can incentivize technology adoption. “Better understanding the impact of technology deployment on labor and personnel towards a more complementary outcome that better develops and harnesses human capital,” AASHTO said. Those four policy recommendations will be forwarded to the AASHTO-AGC-ARTBA Joint Association Committee for review, the group said.